Another wrinkle in the fabric of spacetime has been detected by an ultrasophisticated observatory where UO scientists play key roles. Researchers announced Wednesday that the twin LIGO observatories picked up the minute ripple Dec. 26, leading them to dub it the Boxing Day Event. The wave was caused by the collision of two black holes in a distant galaxy. LIGO stands for Laser Interferometer Gravitational Wave Observatory. With detectors in Hanford, Washington, and Livingston, Louisiana, the observatories use extremely sensitive laser sensing systems to detect infinitesimally small waves, or ripples, of gravity traveling outward from a cataclysmic event, similar to the ripples from a pebble thrown into a pond. UO researchers were among LIGO Collaboration’s founding groups and were part of a recent upgrade of the Hanford observatory’s sensors, an effort known as Advanced LIGO, that led to the first-ever detection of gravitational waves on the instruments’ first science run. That came in September and sparked worldwide awe and acclaim when it was announced in February. In both recent detections, the UO team’s role was to ensure that the signal was actually from a gravitational wave and not the result of a terrestrial event, such as lightning. That was a bit more challenging this time. "During the candidate event, there was an apparently external radio signal down-converting into the audio band at the Louisiana observatory, there were local magnetic and power glitches, cosmic ray triggers and a seismic trigger," said UO physicist Robert Schofield. Ray Frey, head of the UO’s Department of Physics and another member of the LIGO team, said the Oregon group has worked hard to understand exactly how such earthly signals can interfere with a gravitational wave signal. He said they were able to rule out “with high confidence” any contribution from these background signals to the detection. The two black holes that produced this wave were less massive than but just as distant as those that generated the first gravitational wave detection. The waves were thus much weaker, but they also could be observed longer — more than one second and about eight times longer than the first event, GW150914 — giving scientists plenty of time to identify them. 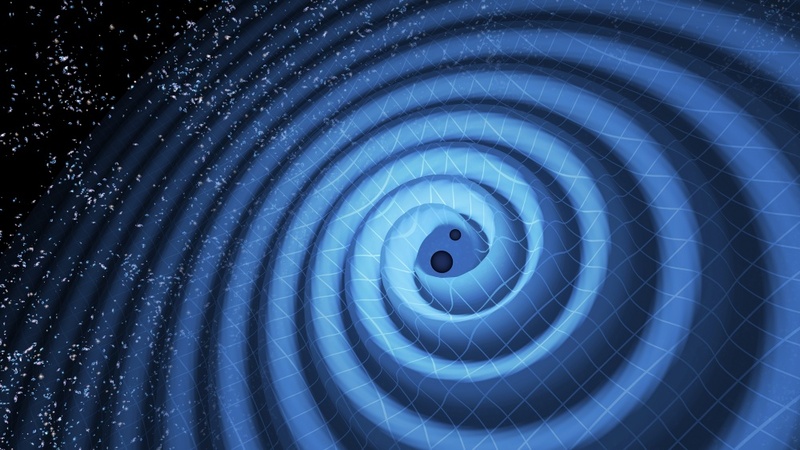 Albert Einstein predicted the existence of gravitational waves as a consequence of his famous general theory of relativity, but until LIGO they had never been observed or measured. The detection and analysis of gravitational waves gives scientists a new window on the universe, allowing them to observe events far outside the Milky Way in ways never before possible. Gravitational waves carry information about their origins and about the nature of gravity that cannot otherwise be obtained, and physicists have concluded that the most recent waves were produced during the final moments of the merger of two black holes — 14 and eight times the mass of the sun — to produce a single, more massive spinning black hole that is 21 times the mass of the sun. During the merger, which occurred at a distance of 1.4 billion light years from Earth, a quantity of energy roughly equivalent to the mass of the sun was converted into gravitational waves. The detected signal comes from the last 55 orbits of the black holes before their merger. Based on the arrival time of the signals — with the Livingston detector measuring the waves 1.1 milliseconds before the Hanford detector — the position of the source in the sky can be roughly determined. “We are starting to get a glimpse of the kind of new astrophysical information that can only come from gravitational wave detectors,” said MIT’s David Shoemaker, who led the Advanced LIGO detector construction program. Advanced LIGO’s next data-taking run will begin this fall. By then, further improvements in detector sensitivity are expected to allow LIGO to reach as much as 1.5 to 2 times more of the volume of the universe. LIGO research is carried out by the LIGO Scientific Collaboration, a group of more than 1,000 scientists from universities around the United States and in 14 other countries. More than 90 universities and research institutes in the collaboration develop detector technology and analyze data; approximately 250 students are strong contributing members of the collaboration. The detector network includes the LIGO interferometers and the GEO600 detector. The National Science Foundation leads in financial support for Advanced LIGO. Funding organizations in Germany (Max Planck Society), the U.K. (Science and Technology Facilities Council) and Australia (Australian Research Council) also have made significant commitments to the project.